The HOBBES vessel R/V Sound is central to our mission to connect program participants to the marine environment. 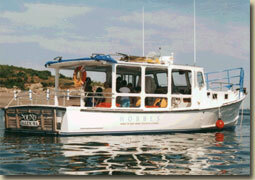 The Sound is a classic 35 foot lobster boat, designed and built by Duffy & Duffy in Maine in 1985. Originally used for fishing in Maine waters, the SOUND was brought to Florida in the early 90’s where she went through the rigorous Coast Guard certification process to allow her to carry passengers for sightseeing trips. She was acquired by HOBBES in 2000 and transported to Massachusetts where she had additional improvements to meet the more stringent Coast Guard requirements for work in New England waters. The stability and sea-friendly lines of the Sound’s hull, a design that has evolved over generations of fishing in harsh conditions, makes for a very comfortable ride. HOBBES has also outfitted the Sound with equipment for viewing, sampling, and monitoring the undersea world to allow for an inspiring hands-on experience.